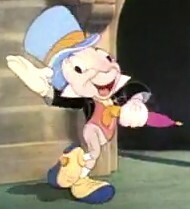 True Hope and a Future: DO YOU PRAY LIKE JESUS OR JIMINY CRICKET?? How often do we ignore God until we want something? How often do we treat Him like a genie in a lamp, pouring out request after request with barely a breath inbetween? Or maybe we act like He's a big vending machine in the sky, thinking "Okay God, I did this, now I need You to do that..."
I've been convicted myself that my prayers can be heavy on the requests and light on worship and adoration. I'm not fond of people who want things from me but aren't interested in a relationship with me, and I can't imagine God is fond of it either. If we continue reading in Luke, we see Jesus begins His model of prayer by saying "Father, hallowed be your name,"
Throughout Scripture we're reminded that God is holy and deserving of our praise. If Jesus began His prayer this way, wouldn't we be wise to do the same? This is our next verse in the "She Sparkles" A to Z Scripture Memory Challenge. (Hey, give her points for creativity - there are no verses that actually start with "X"!) Can you belive we only have two verses left? I have been so blessed by learning these verses; I want you to be blessed too! You can jump in anywhere at any time. Here are the verses we've learned so far. Won't you join us? * Thanks to my good friend Kris, who shared this illustration from Jack Hayford with me. Very cool! So glad I popped over from Beauty in His Grip! I love creative and fresh illustrations-- and this is a new one :-) I totally agree, Lisa-- too often our prayers are full of "Gimme, gimme, gimme" and not enough "Thanks for what I have." Thank you for this great perspective. Be blessed! I came over from A Cat Like Curiosity. I love the comparison to Jiminy Cricket, very clever. I love is my relationship with God. It is such and important relationship in my life. Thanks for reminding all of us this morning that you can have a personal relationship with God. Lovely reminder, Lisa. I do make time in my prayers to praise and thank God but haven't thought about how I would feel if I had a friend who only wanted something from me. That really drives the point home for me and will help me to feel a bit more connected the next time I pray. Great Bible verse listing too! Very creative! How many times have I been guilty of this! This is a good reminder. I want my requests to be seasoned with worship and praise, prayer for others before prayers for myself. Prayers infused with "Thy will be done." I've been on the Jiminy Cricket side of things before. I'm sure I will be again. This is a good reminder to honor God in our prayers. Good thoughts here, Lisa. I was having the same conversation yesterday about this - people do often only turn to God when they are in need. It is amazing when we pause and consider if we are treating God like a wishing star. Your post says it so well. Thank you for sharing your story at "Tell Me a Story." What a captivating question, do we/I pray like Jiminy Cricket? Lots of prayers are like his wish, aren't they? But how elevating just that first request of The Lord's Prayer can become, not only to how we treat His name, but helping make our souls soar like the Eagle, as we stretch upward toward Him, instead of just scratching around in the chicken yard of life like A.W. Tozer said so many of us do. And I really like that Alphabet of verses (including the X)! What a great idea! I'm sorry I missed this series that's almost over. Thank you for a thoughtful, motivating post. I'm so glad I visited here today. I'm just starting a study on prayer. I too have been convicted about the content of my prayers. Wonderful post! I remember wishing on stars when I was a kid. I'm glad I outgrew that. Like others though I'm afraid I sometimes forget to pray to thank Him for all He has done for me until I need something. I agree with you. I wouldn't appreciate anyone treating me like that and I wouldn't think God would either. For God did not give us a spirit of timidity, but a spirit of power, love, and of self-discipline. So good to know the Truth, the Word, and NOT confuse it with other statements or phrases or symbolism. In our present-day world it is hard sometimes to keep things in their right level of belonging and believing. How fitting. I am doing a 21 Days of Prayer Series at my blog. Thank you for sharing and the encouragement at WJIM. Have a blessed week.